Step 1: Thread your needle with 3 yards of Nymo, C-Lon or 6 lb. Fireline. 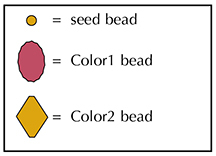 String a seed bead, a Color1 bead, a seed bead, a Color2 bead, a seed bead, a Color2 bead, a seed bead and a Color1 bead. Step 3: String a Color2 bead, a seed bead, a Color1 bead, a seed bead, a Color1 bead, a seed bead and a Color2 bead. Step 5: String a Color1 bead, a seed bead, a Color2 bead, a seed bead, a Color2 bead, a seed bead and a Color1 bead. Step 8: String a Color2 bead, a seed bead, a Color1 bead, a seed bead, a Color1 bead, a seed bead and a Color2 bead. Step 10: String a Color2 bead, a seed bead and a Color2 bead. Step 11: String a Color1 bead, a seed bead and a Color1 bead. Step 14: String a Color2 bead, a seed bead and a Color2 bead. Step 15: String a Color1 bead, a seed bead and a Color1 bead. Step 18: To attach the clasp, string 4 seed beads, go through your clasp and back through the last seed bead that you just strung (the 4th seed bead). 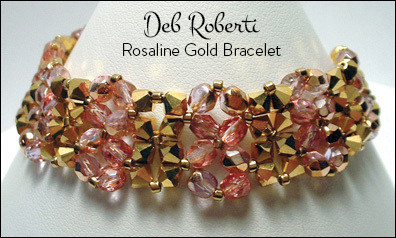 Repeat Step 18 to attach the other end of the clasp.